You are a trained professional, and you are the best in the business. You have the best outcomes, have the best patient scores, and have the highest productivity. Many if not all others envy your skill and respect your success. In school, you studied harder than everyone else and earned high marks and are one of the top ranked in your class. But there is one problem, you went to Medical School, NOT Law school and NOT a business school. The problem with modern physicians(myself included) is that we believe our skill, experience, and knowledge translate to any profession outside of Medicine. Well, remember Julius Irving aka Dr. J only made $230,000 in 1976 and topped off over 1 million in 1950 which by today’s standards are what the benchwarmers make in the off-season. The problem back then was a lopsided negotiation with a team owner who had appropriate legal and business representation with a player who had the best talent at the time but who lack any understanding of the Business of Basketball. The same hold true for healthcare professionals, we understand the delivery of healthcare and are a healer, but we are not Ballers(business minded). Not only is it unwise to navigate the business of Medicine alone, since there is strength in numbers, it is also unwise to use your precious time to negotiate a contract or even find a job when you should be focusing on things that matter like passing your Boards. I am still amazed at how much I have learned over the years outside of Medicine and equally surprised how little physicians and other healthcare providers know about the business of medicine and have absolutely no representation. Join me as I explore the concept of the Physician Agent. I will hopefully have a series of podcasts and blog posts looking at the various aspects of the idea. The first step was meeting Leigh Ann O’Neill Who as a specialist in physician contracts who understands how disadvantaged physicians are in a complex business environment. She understands not only contract law but also the market value of physicians. If physicians do not fully understand all the complexities of contracts, it can lead to a job where you overperform and get underpaid which is a recipe for disaster and ultimately Burnout. Please leave comments, and if you would like for me to explore anything else in this concept, please leave me some comments! 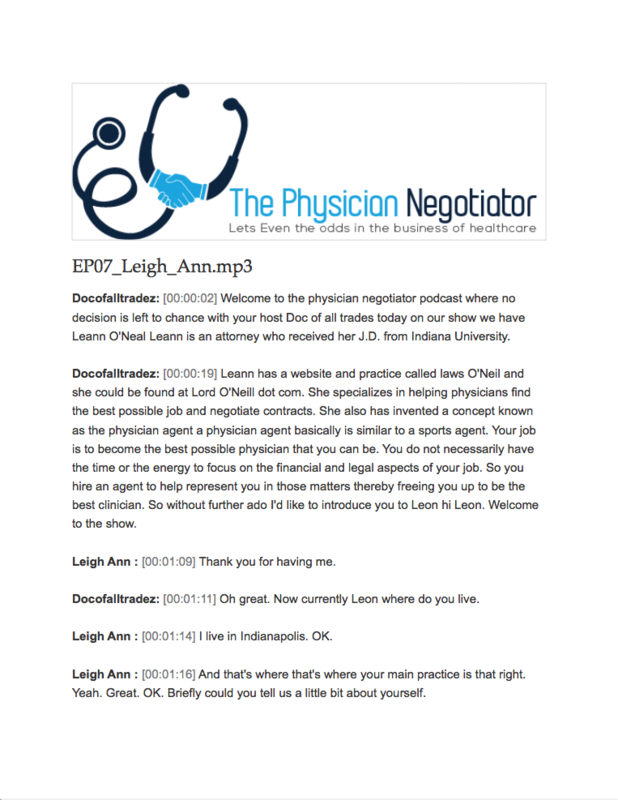 Docofalltradez: Welcome to the physician negotiator podcast where no decision is left to chance with your host Doc of all trades today on our show we have Leann O'Neal Leann is an attorney who received her J.D. from Indiana University. Docofalltradez: Leann has a website and practice called laws O'Neil and she could be found at Lord O'Neill dot com. She specializes in helping physicians find the best possible job and negotiate contracts. She also has invented a concept known as the physician agent a physician agent basically is similar to a sports agent. Your job is to become the best possible physician that you can be. You do not necessarily have the time or the energy to focus on the financial and legal aspects of your job. So you hire an agent to help represent you in those matters thereby freeing you up to be the best clinician. So without further ado I'd like to introduce you to Leon hi Leon. Welcome to the show. Leign Ann : Thank you for having me. Docofalltradez: Oh great. Now currently Leon where do you live. Leign Ann : I live in Indianapolis. OK.
Leign Ann : And that's where that's where your main practice is that right. Yeah. Great. OK. Briefly could you tell us a little bit about yourself. Leign Ann : So I finished law school in 2006 and right out of law school started with a medium sized law firm that had a really robust health care group. And so I spent a lot of my time working both for health care providers as well as individual field irons under Medicare and Medicaid rules also and regulations that apply to physicians and hospitals and then also worked a lot of physicians as they looking at their employment agreements. Leign Ann : And so after being with that firm for a while my husband was actually in his surgical residency at that time and once he was finished with that and started looking for a job as a result I was watching as he was sort of struggling with that process and realized that the full job search process and certainly you know doing a legal review of contracts and making sure that everything is as it should be is not something that a physician can do on his or her own. It certainly worked for physicians in the past but decided that I wanted to focus my work to help physicians specifically job search and contract negotiation phase of their careers. Docofalltradez: So when you were in law school did you ever did you automatically one go into health care. Was that kind of when you were in law school itself was that what you're specializing in. Leign Ann : Yes I did. I actually I always say did I get another life a secretly want to be a doctor but don't feel like I probably could pass the requisite chemistry courses. And so Holly kind of was my goal to help health care providers in a meaningful other way. And I couldn't necessarily I didn't feel like that was my path to be one my my stop. So I wanted to get in health care law to support health care providers. And so it kind of took awhile to morph into what it is today but now I have my company law. All physician agency and we exclusively work for physicians and nurse practitioners and physician assistants help them through the job search and contract negotiation process. Docofalltradez: All right. And you do the next best thing. You married a physician so you guys are or a couple physician and oh my wow. Well so you know short of being able to marry a lawyer what's the next best thing a physician can do to kind of get his or her contract off off to the right start from the get go. Leign Ann : Whenever I talk to a group we offer our educational sessions a lot of time we talk to groups of physicians about this process. I always say that it's important to find a lawyer who specializes in this type of work. So of course lots of people have kind of like their uncle or cousin who's a lawyer and dabbles in this or that and can kind of look over their contract. But I really stress that when you are looking for someone to check out your employment contract or a partnership agreement if you're at that stage and with a private group it's important to find someone who specializes in that type of physician employment work because they are very specific provisions in each contract that apply specifically that you own a mess and there market standards and forms of what physicians are offered today and it's to your benefit to have a lawyer working for you. Who knows what those are. Docofalltradez: And you know most physicians I think we feel like if they were to even consider asking an employer and or partnership to look over the contract with a lawyer and to make changes it almost seems like the lawyer the physician would be afraid because they would don't want to offend that potential employer. Leign Ann : Yes and we actually hear that all the time that's a concern that a lot of clients have when they come to us it's kind of they're worried that it might come off badly if they know if their potential employer knows that it engaged a lawyer. And so the thing I always like to talk to clients about though is that especially when you're coming out of training your relationship with your employer up to that point has been very much of a mentor mentee type relationship versus once you're out of training it's more of a traditional employer employee model and the employer is not able to look out for your own best for your best interests as well as their own best interests. And a lawyer drafted that contract for that employer. Right. And that means that they kind of have the upper hand when it at least when it starts off. And so you know they're protecting their best interests and you owe it to yourself family to protect your best interests as well. And so you know actually a lot of employers I think are becoming more sophisticated about this as well and oftentimes we hear you find a provision in a contract that specifies you've been given the opportunity to consult your own legal account. A lot of employers are really interested in entering a relationship that's been very well thought out and considered and they do not want you to move ahead and sign the contract if they don't feel like you've had your fair review with your own legal counsel. Docofalltradez: So that would be kind of a warning sign right. So if you have a group or private practice it comes to says hey well what we voted you got the job so are you to join us. Right. And by the way you've got two days to review the contract and get bachelor's would you say that's a warning sign. Leign Ann : Absolutely and that's another thing we hear a fair amount. Is a client will call us and say well you know how fast can you guys do this because they told me the deadline is Friday and if I don't sign the contract then they're going to offer it to someone else. Well first of all that would definitely be a red flag to me. Any employer that's trying to pressure you into accepting a job in you know in a big disingenuous about that. Also most employers even if they do have a deadline a lot of times it's sort of an arbitrary deadline that was set just by way of default when they draft their legal documents. They have an expiration date right. And it's not something that's set in stone. So I mean all the time we encourage clients in this work successfully for them to contact the employer and say hey really just want make sure I'm giving due consideration to this prospect I'm really excited about this job. But I need another week or so to go through this with my own attorney and make sure that I understand it fully and employers are usually very gracious about extending those deadlines with no problem. Docofalltradez: So you know what's happening right now in the medical community in the medical field is more and more physicians are becoming quote unquote W2 employees and of hospitals or super groups and so do you find it's happening more often like the pressure tactics with smaller private practices or these more or hospitals or the bigger groups it to be more one way or another necessarily. Leign Ann : But certainly when you're dealing with a larger hospital system or one of the super group type of employers there is you know it's more likely that they would have a sort of an automated mechanism for asking for a return contract. You know on a tighter I am frame and I just think that it's more symptomatic of having kind of a very process oriented human resources division then their intention to be a kind of bully someone into signing something. So honestly I've never really run into the scenario where a client called back an employer and asked for additional time and they said never mind we're taking we're withdrawing the offer or no you don't have any more time we need it. Hard deadline by X day. Certainly that's kind of a judgment call yo come upon it. You know that the position that you're interviewing for and you have an offer for if they have kind of a line of candidate you know ready to act then they may not be bluffing if they have a dire need to fill a position then you know they may require a quicker turnaround time just because they can and they have someone else right behind you ready to sign the contract. But most the time when physicians are taking a job at such a particular need that's being filled it's usually happening very far out in advance months sometimes more than a year. So it's not typical that it's you know a serious deadline has to be met immediately. Docofalltradez: Do you find is it easier to deal with the bigger groups or the smaller groups you find there's a difference between the two in general. Leign Ann : You know it's interesting because there is sometimes there are but I wouldn't say that it's kind of a blanket difference I wouldn't generalize it but some of the differences you notice just hospital systems do tend to be more since they're more business minded. Leign Ann : They seem to be more sophisticated from a legal standpoint and so they have their own legal division. They have a more it's more of a standard expectation that legal would be consulted on all aspects of a contract being signed. And so in those situations particularly they do encourage the candidates to go and have their own lawyer look at the contract and they're not at all you know offended or scared off by the prospect of being contacted by a lawyer. Whereas on the private groups side and I've only really seen this one time is where you kind of get into the good ole boys situations where you know it's a partnership of five physicians that are in the latter part of their careers and they themselves no sign contracts and they go to bring in the new young physician. And the idea of a contract at all is sort of laughable to them it seems lacks or sparkle. And in that case you know we'll sometimes have a little bit of a hesitancy on their part to involve the lawyers but that's very very atypical. Docofalltradez: You know when you're you've negotiated your husband's contract right. Yes. Did you run into any landmines when you were doing that. I think you and I talked about it before right. Leign Ann : Yeah. Oh I can't remember if we discussed nothing. There was nothing that was a landmine in the contract that he's ever signing thankfully. Leign Ann : But you know we do come on particular aspects of agreement are concerning and really one that we take away from doing this for physicians is just making sure that we have a very thorough process. Like for instance one of the things that we found when we do work for physicians is if you have revisions made to contract you get the revised version back and suddenly I'm back. They wanted left along was now a contract. And if you can review the new version you might not know that it's important to obviously be very thorough. Leign Ann : We are doing the review and making sure that everything is in place especially when we sign the final version that it is. And there remained what you thought it was. Docofalltradez: We know we haven't spoken about the money in terms of the contract which was the same as the one the most important aspect of the contract. What would it be. Would it still be on computer or would it be something else. Leign Ann : You mean other than the compensation also. Docofalltradez: Well so so would you say the compensation would then be the most important aspect. Leign Ann : I mean it's kind of hard to say that it's not up there because you know you're the way you're making a living of course. And so another reason that it's really important because kind of along the same lines the line you distrust or unhappiness by way of comparing notes with other employees. Leign Ann : You know I've seen clients that will come to me and they'll say you know I just found out that this job I took when I got out of training you know they're paying their way underpaying me compared to what someone who does the exact same thing getting paid down the road that breeds all sorts of unhappiness and resentment of the employer. And so let alone you know just the feeling that you could have been doing better all these years. And so it's not that what the number amount is the end all be all but knowing that it's fair as compared to market standards is hugely important for many reasons. And so one you know one common misconception or I think something that people often get wrapped up in especially when they're entering their first job out of training is looking at what a base salary would be. And for certain specialties the base salary will become very quickly irrelevant once they are you know kind of ramped up and providing services on a full time basis and producing you know the median level of services. And at that point a lot of contracts will roll you on to a production model compensation. And so that's where. I always recommend a lot of focus be given to make sure that a productivity model is also in line with what market standards you know other employers in the area are offering because that will end up being your main mode of compensation. Once you are ramped up and offering you know a full four weeks worth of services. Docofalltradez: And generally speaking how do you determine that calculation. Leign Ann : We look at MGM a data estimate the Medical Group Management Association and they put out a survey every year that is based on data they collect from every different subspecialty extradition and it will show you things like total compensation what compensation to collections ratio is which is pertinent if you're in a private group what compensation per WRVA you rates are. We'll break it down by practice or employer type by geographic region of the country. And so we like to look at that data. And my goal is always to be able to say OK yes we've looked at the compensation model they're offering you. And if you produce the median amount of services as compared to everybody else in your region of the country or the nation you are capable of earning at the end of the day under this contract the median total compensation that's being earned by everybody else. So that's just a good benchmark to use. Docofalltradez: So generally speaking and for people who don't want them MGMA is so like you said it's a database of get contributed data from different practices all over the country and they break it down into percentile right. And so you mentioned the word median and so the median percentile would be the number of people who make a certain salary based upon production based upon their specialty etc. and then they could fall either into the 25th percentile or the seventieth percentile 25th percentile or the 98 percentile. So generally speaking do you feel that the median is a median salary for a particular specialty is a fair goal to shoot for or do you do shoot above that. What would you typically advise on a situation. Leign Ann : The median is what we typically shoot for and when you're talking about someone who's then you're wanted to have training that might not be necessarily attainable because it is it is so it does take a good amount of time to build a practice depending on your specialty. Again this is totally specialty dependent. So it really depends. But it's good to at least I mean the goal is to at least see if you're producing at the level whether it be the 25th percentile of the median or the 70 percentile then you should be able to see that under this contract you've been offered. You would also be compensated at that level. Leign Ann : So the thing to look out for is let's say you're producing at the seventy third percentile in WRVA that you produce. But at the end of the day you're only going to get paid the 25th percentile. There we have a problem right. Docofalltradez: And so that's what MGMA is really good at. It shows what were different like for example you say units versus RVU use with those. What would a median person would produce. And so you're saying if the decent layman define what you do and then what you earn there's a huge problem there. But right do contracts typically say that we'll we'll pay you you know X number of dollars for X number of revenue based upon the MDMA would they actually use that type of language. Leign Ann : Sometimes they do specifically say we'll pay the median MDMA rate per GABA our view in that most the year you know that years most current survey sometimes is that reliant on the MDMA data other times we'll just publish the number you know the number will be put in the contract and it is based on sometime in blend blended review of different surveys that MGMA survey and others that are specific to certain specialties that it really just is you know variable between specialty and employer but MGMA. I have found is the most widely used. Docofalltradez: And that's what you would recommend any physician have that in their contract or not necessarily. Leign Ann : Well I don't think that it has necessarily reference to MGMA. But it should be structured so that you are capable of earning in those median ranges. Docofalltradez: And in terms of So my other my other understanding about it is that anybody can have access to it. The data itself is very expensive so I think what sixteen hundred dollars just for an annual book or something like that. Leign Ann : I'm not sure we pay a much higher fee for a license to use it. So yeah but even if you think that if you are a health care provider let's say you're a family practitioner and you want to hire a new doctor you would want to look at the MGMA data. I don't want to go out buy it. I mean I think the minimum you pay is like a thousand dollars in any form of it. So yeah oftentimes we can find lawyers or consult the various types to that know have already purchased the data and obviously can pass that along to their client. Docofalltradez: And the advantage of somebody like you you actually know what the data means which actually is pro even more important. Right. Leign Ann : Right. Right. And we're able to sort of you know look at the different pieces of the data and relate it specifically to your contract. You're looking at a table of data. It doesn't really mean much until you're able to compare it to what the compensation model you've been offered of course. So yes variable to easily relate to. Docofalltradez: Wow that's awesome. In terms of so so let's say we have a contract down where we were totally in agreement with the contract. You looked at it you signed off on it. You're happy. The physicians happy the employees happy and then two years down the road something happens and we need to renegotiate. 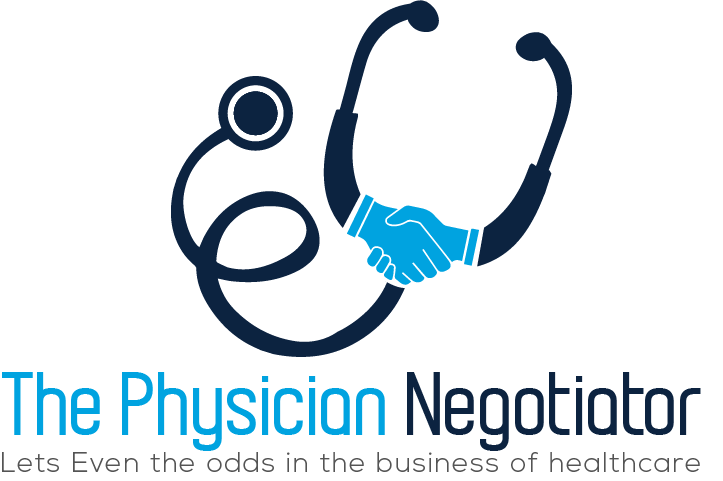 And do you maintain the relationship with physicians typically during that renegotiation and it could be maybe a problem that you have with your employer or a colleague or maybe you find out something down the road makes a lot more money than you. You could basically then initiate that contract renegotiation. Leign Ann : Yes. And it will depend on the terms will be specific in your contract though. What we most commonly see is for a first time contract will say that the contract is for a period of two years and that it will automatically renew for one year period after the for the first term is over. So in other words it's to your contract at the end of the second year it's going to not auto renew for another year. And so you have to be careful what the renewal provisions say. A lot of times it'll say that it will automatically run or do if either party gives notice of their intent not to renew within 60 days before the expiration date. So if you're unhappy and you're coming up on the end of your second year and you need to tell them within 60 days if you intend to not let it automatically renew then you need to give that notice and that will force the renegotiation of the contract. Docofalltradez: And yeah I think that's that's why it's incredibly important and usually that's to the physician's benefit. Have you ever seen a situation where it's been to the employer's benefit where they've actually had to give less and less less money to the physician as a result of changes in markets market forces etc..
Leign Ann : There are a lot of times we'll see contracts that have a provision that say it's like overall Medicare reimbursement drops more than a certain percent then we can unilaterally amend your compensation. And so in those instances it becomes hugely important to make sure that those other provisions of the contract that are impacted at termination or that are triggered by termination don't negatively impact you like for instance the non compete if you get a pay cut because of a reimbursement change that happened at the government level and over which you have zero control you're going to take a giant pay cut now because your employer was able to unilaterally amend your compensation you're like You know I'm going to get out of here and go find a different job where I can be paid more. Or at the level I was being paid before. So it's not your fault that you had to terminate the contract for that reason. So we want to make sure that the not repeat not can apply in that instance of termination. Right. But things like that and that's getting really into the weeds kind of but and it's always very taboo for folks to think about situations like that. You know you're like coming out of training you're so excited to start your first job. So I think you want to do is talk to your employer about how we're going to deal with. You know the termination of this contract you know when we're just now getting started but those are kind of the you know doomsday scenarios that we know lawyers are here to help you plan for and to avoid you know the worst case scenario. Docofalltradez: And I think you said it to at one point that that's why you really do want to negotiate your contract with your employer so that you can save face. Right. If you negotiate better contract as as my attorney therefore you know you're the one who's dealing with the terms and it doesn't harm the relationship and you've you're right. Leign Ann : Exactly right. Yes. OK.
Leign Ann : Excellent. I mean and not only does it remove you from having to be you know the person who's asking what might feel like these awkward questions right. Because it's at that point it's kind of personal if I'm doing it or a lawyer you've hired is doing it for you purely technical and it's a business and beyond that you know we can say it's not because I don't want this client to get you know the right of a deal here it's because I do this all the time and no one else in contract has it in it. So why are you guys trying to have your employees sign a provision like this. Is the typical. So you know we can kind of look out for position for our clients based on our knowledge. That's very specific to what's going on in the market in general. Docofalltradez: And you know Leon and the whole basis for our conversation was that the whole I know you've created this concept known as the physician agent. And so like sports agents you know you can always look after your your client and in this case it would be a physician as opposed to sports agent such that you know you don't have to kind of go at this on your own. And I just came back from a conference where a lot of burnt out physicians who were in the process of quitting medicine entirely because you know for one reason or another they were overburdened by the workload. Maybe they had a falling out with a colleague and or a practice. And so their solution is what I'm going to get out of medicine altogether. But I kind of like if they had been protected in the first place had they had good counsel maybe they could have either avoided the situation or be come up with a better situation such that they wouldn't get to the point of nice when to quit medicine because it's not working out for me right. Leign Ann : Exactly. And you know one of the things that I think physicians run into a lot is that they feel they sometimes get to situations or they end up feeling that they were taken advantage of and they didn't have a fair crack at the negotiation process on the front end. So they come out kind of disgruntled you know after they've been with a particular employer for a certain amount of time and they feel like you know it was an unfair relationship to begin with but also physicians are good at taking care of their patients like what they went to school for that's what they've trained for years and years for and that's within their heart to care for their patients if not necessarily first nature to physicians to be honing in on particular provisions of a contract or looking out for themselves at all. I mean that's there in the business of looking out for other people for their patients. And so they're not necessarily good at sort of thinking tactically about how to avoid being in that situation where they feel taken advantage of. So for instance the one thing that I would tell a physician you know any of my clients who I operate in this position agent role like you said you know like a sport like an NFL player has their own fourth agent someone is looking out for them if you're unhappy in your job you need to go out and interview for a different job even if you really don't think you'll ever move and take a different job. You need to know what's out there and you need to know the ways in which different opportunities could be a better fit for you or how your current opportunity actually ends up being better than you thought it was. Leign Ann : All right here's the other one. You just interviewed for one of the worst things that I see. You know when clients come to me happen tends to happen like in March April of every year we'll have clients call and they're like totally freaking out because they have to sign this contract and they only want to take this job but they have to because they didn't you know get a job offer until now. You know the timing has to be right and it has to be well in advance of when you need to start getting that paycheck and putting yourself out there and having multiple interviews is the only way for you to a see all the different types of practices that are out there and what would be a good fit for you. B See what the markets truly offering Yo so I can't recommend enough that physicians do a very detailed in-depth and it's kind of like Doc in a job search to get out there and see what's available and don't get stuck in the point where you feel like you have to stay at your current job or you have to take the first job that comes your way because there is a lot of opportunity out there for your position. And if you approach it in the right manner. You know you're going to have a better result long term. Docofalltradez: And you know it's funny that's funny you say that because that's how residency works right out of medical school. You're going to apply to as many residency spots to maximize your chances of getting matched and being the right match the right fit right. So right. So this has been the most funny and most interesting time in my life because I'm a mid career I'd say and I'm going to mid career crisis and so I'm not consciously I I've followed your advice exactly in that I was kind of feeling unhappy with my current position. I'm very well-established. I'm very you know as you become a mature physician you become decorated you earn the trust of your colleagues of surgeons of various people and then you're willing to basically say well I'm Burns I'm going to walk away from this not realizing walking away from it you just think about the new grad like you said it takes some time to even get to the point where they're going to make to the median salary and when you walk away from it it's not like you can just go back and get it. So what it was. I was just on the phone with a friend of mine and he says Oh yeah we're hanging at my job. Docofalltradez: You should come check it out. So I go and I interview and I do a two day interview with them and I'm talking to them and kind of getting a sense of how they practice medicine you know what's what's there. Is it justice fair place. What kind of money they make. And as it turns out my current practice is probably slightly better than there is but dread. Granted I tested out the marketplace. I saw it right out there and I'm like well you know I could move but then I'm going to have to establish relationships with people all over again. I'm going to have to earn partnership again. It just takes one or two guys to not accept you as a partner and then you don't get in the group. And then all for what you might you might have been better off trusting where you're at but at least now. Right. I did the litmus test and now I know that what's out there is not necessarily better than what I have. Leign Ann : Yes exactly. Exactly. And you know even to take it one step further if you had you know found certain things looked better to you about the potential new opportunity you could bring that back when you come to negotiate your existing contract and say look you know here's that opportunity. This is better. You know I'd like to stay here because I have you know I've established here I have a good relationship here. But you know it's kind of hard for me to ignore that this other opportunity is offering X Y and Z that you don't offer. Right. Well you can get them to do there. Docofalltradez: And so for me that's a little nerve wracking. I'm a little bit nervous about Doing that because you know on the one hand there's still your employer and you don't want to push it too far. Such that I lose social credit but at the same time you're right. Obviously I took the steps to go look for another job and interview so clearly I'm not happy right. So I think you're absolutely right you have to leverage that. Docofalltradez: You have to say hey you know where do the steps that I can take in order to make my current situation happy by leveraging another interview process and seeing what's out there and going back to my employer and saying hey this is really what I need to make me happy or if not I can always go to this other job and make it work. So either way you have. The key is to give yourself as many options as possible. Docofalltradez: That's going to wrap this up. Now you you like you said you practice Indiana and I think you and I mentioned that you you could still potentially represent a physician anywhere in the country so long as you have a you said you have an agreement with somebody in your in their current state All right. Leign Ann : We actually work here. We work with. We have co counsel relationships with lawyers all over the country. So we literally provide services for clients taking jobs in every different state. I mean I mean literally I can't think of a state we haven't worked for somebody. So we always consult our co counsel that are local to make sure that we've covered any state specific issues typically. I mean 98 percent of contracts are general and they're not tied to state law concern. But of course we have to make sure we've covered all of the big bases though we do always consult with someone in that state and that we do that at no additional expense our clients that we've established with our co counsel relationship. So we are able that third client in all different states and we do the job search service for our clients. Leign Ann : Also some of them come up. I don't know where I want to work exactly I just know I want to have. This type of job I want it to be in a city with at least as many people and really good hiking trails. And please call me everywhere you think would be a good family do that for for people to forget you did that. Docofalltradez: Yeah so that would be great. So if me wanted to say target a city you know Indianapolis. You could then basically call every hospital where we practice. Yeah. We scout for them. Leign Ann : Yes we I mean we even do it like on a large scale. I mean right now I'm looking for a client who wants to join a private practice where I'll be a partner one day hopefully have ancillary income so we're identifying literally like in every state all of the practices that we think meet those criteria and find all the contact information and we email for the client to you know. So they don't have to go through kind of that you know grunt work for lack of a better phrase of you know drafting 80 e-mails and attaching their cover letter and CV. So we do all that work for our client help out. Docofalltradez: Especially when you're in your fellowship and or residency and you're trying to practice for your boards right. Leign Ann : Yeah I mean there's I mean you got to put yourself in a position where you feel confident that you have literally left no stone unturned that you've looked at every feasible opportunity that's out there for you. That's where we come in and do so much research and legwork and you. We want you to go to interview with me that you can for that when you sign on the dotted line you feel like Yep I checked out everywhere you see the wall and this is the best fit for me. Docofalltradez: That's awesome yeah. And today I have so many friends who don't use attorneys that they just deal with internal battles in their practices legal battles and then you never see counsel and I'm like What are you doing. I don't comprehend that so. Great well yeah. Leign Ann : I mean always remember the employer has their lawyer the executor looking out for the. Leign Ann : Well your no reason why plural lockable lawyers like an entire firm of them and there is no reason why someone is highly educated and trained at best why if there's any provision is should not have their own legal counsel especially especially like your law firm because you guys actually this is what you focus on above all else. It looks like yes. Docofalltradez: Yeah. Yeah. So whereas it was the best way to get a hold of you. Docofalltradez: How should we actually read you. I'm going to put it in that note on the show notes as well but I would think this way to. Leign Ann : Get all our law firm or our position agency in law O'Neill dot com that's L.A. u t h o and e i l l dot com it's lop O'Neill position agency you go to that Web site you'll be able to find easily my phone number and email address and E are available any time outstanding. Docofalltradez: Well hey it was great talking to you it's kind of weird how was. Well I mean it's so coincidental how life you know intercedes. Yeah. Maybe subconsciously I was seeking you out because I was seeking for another employer you know it's so funny. Leign Ann : Right. Right. Says yes. Docofalltradez: The student will on this the student will always find the teacher. I think that's how the expression goes something like that. Leign Ann : Yes. When they're ready. Yeah. Docofalltradez: When they're ready the student will find the teacher right. Leign Ann : Right. That's too funny. No I'm so glad that you found us and that we're able to have this conversation. I hope that it helps others you know who are in the same position are beginning to like a job you know to be very diligent and thorough. Docofalltradez: Oh absolutely. And David in mid career you know anybody goes through a Medicare crime mid career crisis like me I mean this the amount of information that information is valuable and. Docofalltradez: Right. And you know I to you know certainly I'm going to let as many people I know who who are struggling to reach out to you as well. Leign Ann : Thank you all. Thank you. We would be very very happy to help. Docofalltradez: Excellent. It was a pleasure talking to you and I think we'll be talking to you as well I hope. Yeah. Hopefully we can talk again soon. Noel thank you so much for having me. Great. Again it was great talking to you. We'll talk to you too. Thanks so much. OK. Bye bye. OK.
Docofalltradez: I you would like to learn more about Leann and or her concept of physician agent. Head over to our Web site at or head over to my Web site at the That's There you'll find show notes and links to Leigh Ann and her Web If you have any other questions for me or the podcast if there's something in particular you'd like to hear from LeAnn or something a topic you would like for me to discuss on the podcast. Please leave it in my show notes or during the Web site itself. You can leave comments. Thanks for listening. I really appreciate it. Talk to you soon. Docofalltradez: Thank you for listening. We hope you enjoyed the position negotiate a podcast show notes and other resources. The above audio transcript of "EP07_Leigh_Ann.mp3" was transcribed by the best audio transcription service called Sonix. If you have to convert audio to text in 2018, then you should try Sonix. Transcribing audio files is painful. Sonix makes it fast, easy, and affordable. I love using Sonix to transcribe my audio files.